British and Saudi authorities have reportedly postponed to early March the visit by Crown Prince Mohamed bin Salman (MBS) to London as fears for unfriendly reception from rights groups opposed to Saudi Arabia’s war in Yemen look serious, Middle East Eye (MEE) reports. The London-based news website notes that UK authorities have become concerned about hostile media coverage of the visit, which was initially scheduled for this month. Aside from media, rights groups and associations opposed to UK-Saudi Arabia arms trade and the Saudi-led Arab coalition in Yemen are planning protests against the visit. A new date for the three-day visit has been set for March 7. London is to be a first leg of a tour to take MBS also to Paris and Washington. Saudi Arabia has been criticized for its intervention in Yemen where the UN is talking of the worst global human catastrophe. The Crown Prince is said to be the architect of the intervention of a Saudi-led coalition. The 32-year old Crown Prince who is credited with the unprecedented across-the-board reforms in the kingdom also drew sharp criticism from rights groups over the crackdown on domestic critics. 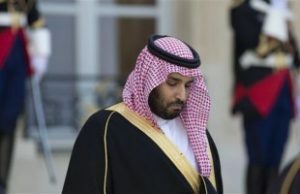 Several clerics, activists, poets, journalists and academics have been detained in the Crown Prince’s move to impose his rule. Changing the date of the visit will not however discourage protesters. Saudi Arabia last year adopted some reforms favorable to women, such as the right to driving, but critics say the Saudi society is still hostile to the role of women in public life. The crown Prince March visit will take place on the eve of International Women’s Day, Marked on March 8. “Despite the crown prince’s talk of ‘reform’ in the kingdom, there’s been deepening repression – with more arrests of opposition and human rights activists, scores of executions, countless unfair trials and ongoing reports of torture in detention,” said Kate Allen, Amnesty International UK’s director. The March visit will give momentum to discussion over London’s willingness to buy five per cent of the Saudi state-run oil giant Aramco. Mr BS is desperate for cash. Get yourself a good deal UK then wind up like BP in LittleWadia or BP in Venezuela.